Whether destined for greatness, called to action, or rising to the occasion, heroes are an important part of any story. Their background, actions, and adventures help readers relate to and derive meaning from their narratives. 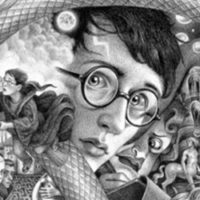 In this two-day class, draw inspiration from the work of Harry Potter illustrators Jim Kay, Mary GrandPré, and Brian Selznick to create and illustrate your own fantasy-based hero. Your heroes will need to fight someone! Learn how to illustrate villains at our two-day class, Illustrating Villains.